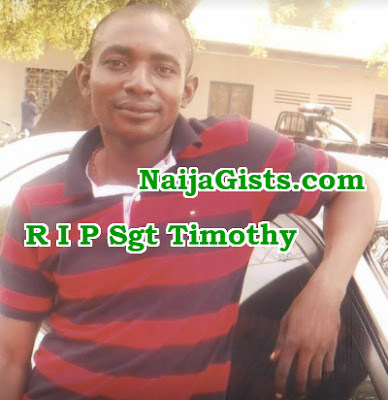 Meet Sgt Timothy Emmanuel, the Mobile policeman killed by his colleague in Madagali town, Adamawa state yesterday. Around 10:45am on Tuesday, the deceased reportedly engaged his colleague, Police corporal Bala Adamu in an intense religious argument that reportedly caused a physical fight. The deceased who was among the Special Forces deployed from Makurdi Benue state to Adamawa on special assignment reportedly died of gunshot wounds even as his colleague fled after the attack. The suspect has been arrested and transferred to the CID department for investigation.